ARE ALL THE PROPERTIES DOG FRIENDLY? Absolutely. All of them very much welcome dogs (or they wouldn't be with East Ruston Cottages!) and all have something extra -from a dog bowl and a few biscuits to bowls, throws, toys, spare leads, crates etc. DO I HAVE TO PAY EXTRA FOR MY DOGS? In a word, NO!! We never have and never will charge for dogs; it was our main rule when we started in 2008 and we have no intention of changing it! Each property is different. There are very flexible number limits assessed by us and the owner, based on the size of the accommodation, the type, size and sometimes age of the dogs. After all, 4 Great Danes would be a bit different to 4 Chihuahuas!! We have had groups of 10 and 11, with the most at any one time being 16 little ones but many of our bookings are 3 - 5 dogs. Please do ask! Yes. No breed discrimination here! DO ALL THE PROPERTIES HAVE AN ENCLOSED OUTSIDE SPACE? Yes, they all do, varying from a small courtyards to huge grass back garden. Details of the fencing/boundaries are included on the individual property description and we are happy to provide more information and photos if you email your query. None of them will claim to be fully secure for ALL types of dog but they are all enclosed and all the owners have done their best to provide a safe area for the majority of dogs. 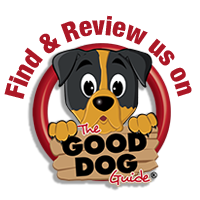 We understand that different dogs have different requirements and will be happy to work with you to identify which property would be best for you and your dogs. ARE DOGS ALLOWED ON THE SOFAS AND BEDS? In all the properties dogs are allowed on the sofas (with throws provided in most properties) In many of them they are also very welcome on the beds too, if that is what they are used to at home. We do ask that throws are used or that you bring your own bed linen. ARE ANY OF THE PROPERTIES WITHIN WALKING DISTANCE OF THE BEACH? Thatchers, Orchard Cottage, The Crib, White Cottage and Heather Cottage (all in Happisburgh) and St Benets in Sea Palling are a short walk to the beach. Corner Cottage is about a mile away from Cart Gap as is Victoria Cottage, The Peanut and The Walnut. Hidden Gem in Winterton is at the back of the dunes so almost on the beach! ARE ANY OF THE PROPERTIES ON THE NORFOLK BROADS? Yes, Red Roofs is just opposite Hickling Broad and Milldene and Patikipa are right on the river edge at Potter Heigham. All of the properties are a short drive from the Broads and many of the boat hire companies allow dogs. DO ANY OF THE PROPERTIES HAVE A DOG FRIENDLY PUB WITHIN WALKING DISTANCE? Rooster Barn and Farthing Cottage are a very short walk to The Crown at Trunch. Hidden Gem is a very short walk to the Fisherman's Return in the village. Orchard Cottage, The Crib, Heather Cottage and Thatchers are very close to the Hill House at Happisburgh and White Cottage and Ollands Farm Barn are a little further but still an easy walk. You can walk to The Butchers Arms and the pubs in Stalham from Wind In The Willows, The Lodge and Holmes House and from St Benets you can very easily get to The Reef Bar close by. Red Roofs has the choice of The Greyhound and The Pleasure Boat within easy walking distance and if you don't mind a 2 mile walk (along quiet country lanes and tracks) you can walk to the Vernon Arms (a great pub) in South Repps from Milestone Barn. Both the riverside cabins, Patikipa and Milldene, are an easy walk to The Falgate Inn. The Star at Lessingham, one of our favourite dog friendly pubs, is a very easy, short walk from Corner Cottage, an easy walk from 1 Chapel Cottage and can be walked to from Ollands Farm Barn and The Peanut, The Walnut and Victoria Cottage! DO THE LOCAL BEACHES ALLOW DOGS? All of them do. From 1 May - 1 October a few of them have restrictions but many of them don't and where there are restricted areas they are small and there is plenty of beach left without restrictions. Full details here. DO YOU TAKE BOOKINGS ALL YEAR ROUND? WHAT IS THE DEPOSIT FOR A BOOKING? CAN I BOOK A SHORT BREAK IN ANY OF THE PROPERTIES? Short breaks are often available in many of the properties, mostly out of season (Nov - Feb) but please do email if you are interested in a particular break. There is a minimum stay length of 3 nights, although Wind In The Willows will take 2 night bookings. The normal arrival time is 4pm and departure is 10am but it is often possible to arrive earlier and leave later, particularly when there is nobody in or out on the same day. But this is very much down to the individual owners and cleaners so please do ask. CAN WE GET A GROCERY ORDER DELIVERED? At many of the houses you can arrange for a supermarket delivery to arrive before you do and have it put away but it does vary so please do check first. WHERE CAN I GET LOCAL PRODUCE? All over the place! We have so many great places to choose from! Truly Local in Stalham High Street stocks food from within a 35 mile radius and can put together a box for you to collect (maybe can deliver to some properties) for when you arrive, Meales Farm Shop outside Stalham and Cooks of Ingham Farm Shop outside Sea Palling sell great fresh veg and a lot more besides. Tavern Tasty meats can do a delivery too of a locally produced meaty hamper to your specifications! Picnic hamper or BBQ selection and much more besides! Plenty of little gate sales too in and around this area. IS THERE SOMEONE WHO CAN DELIVER MEALS? RAW FOOD DIET AVAILABILITY AND STORAGE? If you feed your dog raw there are several places in the area where you can get fresh and frozen supplies and many of the properties have enough freezer and fridge space to help you plan. See the It's A Dog's Life page to find out more. DO YOU HAVE OFFICE OPENING HOURS? Not really as ERC is run from home by me, Sue Allen, however, I do appreciate phone calls being kept to sort of office hours, 9am to 5pm and preferably not on a Sunday. You can leave a message any time and emails are always welcome (and are the best way for enquiries and bookings). We do, and debit cards (not Amex). You can pay online at the same time as you make a booking. When you book you will get a link to the secure online payment system that we use and when we send out the balance request there will be another link. This is by far the most secure way of paying by card. PLEASE NOTE that we cannot take payments over the 'phone. Do we ever! Follow us here. Lots of photos and comments from past, present and future guests. Over 7000 people like the page. We do Instagram too and a little bit of Tweeting. We do! Any value, 24 month limit and for any property. Just email sue@eastrustoncottages.co.uk to order one. CAN I READ ANY INDEPENDENT REVIEWS OF THE PROPERTIES? DO YOU HAVE ANY RATINGS OR STARS FOR ANY OF THE PROPERTIES? We don't belong to any ratings or awards schemes as most of them cost a lot of money to buy into and we would rather spend the money on advertising and the properties themselves. We hope the bookings speak for themselves as do the comments on the guestbook pages. DO YOU HAVE ANY SPECIAL OFFERS/MAILING LIST? We do! We regularly run fundraising campaigns and make one off donations to various animals charities. We also try to make sure that all of our owners buy their dog biscuits from Nero's Kitchen in Happisburgh where handmade dog biscuits of all sorts of flavours are sold to raise funds for dog charities.